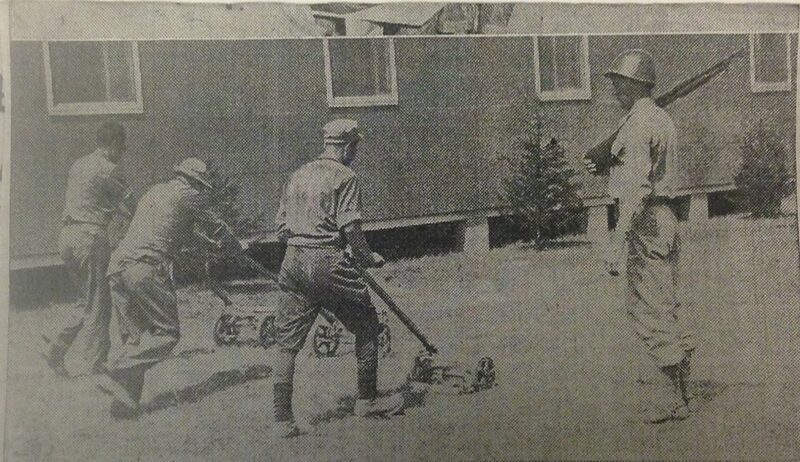 Lawn mowing was reportedly one of the most coveted jobs at Camp Atterbury amongst Italian POWs reportedly, which apparently weren’t used much in Italy. Indianapolis Star, 13 June, 1943, 6, accessed Indiana State Library, Clippings File. It is entirely likely that more than one farmer will apply for this Italian labor. The farmers are badly behind their work…Industry and the draft have created a serious farm labor shortage at the very time most farmers are trying to increase production…for the food needed for victory. Farmers across the nation felt the pressure of wartime demands. 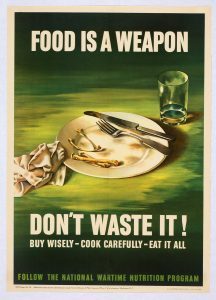 In addition to soldiers, an unprecedented number of workers were needed to produce food, clothing, supplies, and munitions for troops. Balancing all these demands proved difficult. The Bureau of Agriculture reported that between April 1940 and July 1942, two million men had left their agricultural jobs for employment in the military or war industries. Reports surfaced of farmers unable to get all their work done without additional help. The Tribune in Seymour Indiana reported that a Maryland farmer, “another victim of the manpower situation,” had to plow under thirty five acres of beans after his call for pickers came up empty. Hoosier farmers hoped the situation wouldn’t repeat in Indiana. OWI Poster No 58, Office of war Information, Washington, DC, 1943, photo courtesy The American Legion. 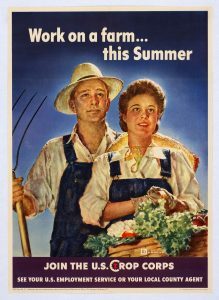 Meanwhile, the federal government emphasized farmers’ need to produce more, despite the labor shortages, to help win the war. President Roosevelt created Farm Mobilization Day on January 12, 1943. 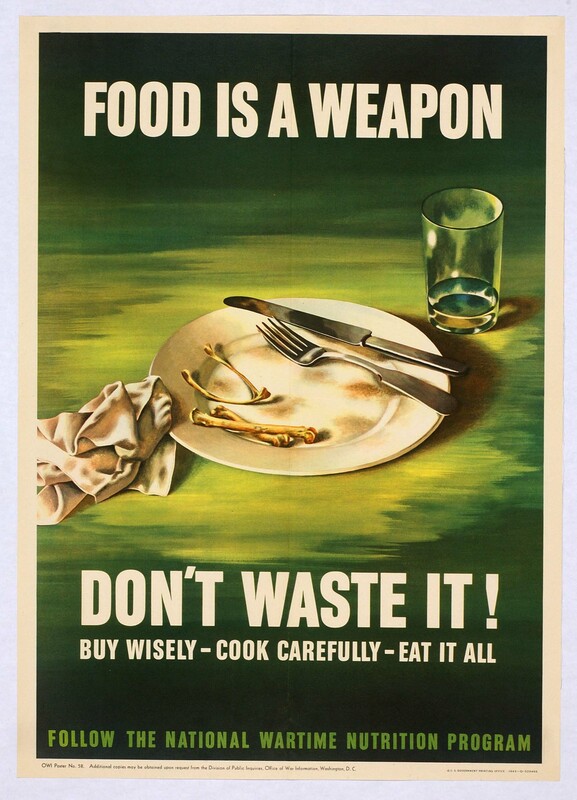 He declared “food is the life line of the forces that fight for freedom.” Soon after, the Office of War Information produced pamphlets, posters, and films filled with catchy slogans like “Food Fights for Freedom!” “Food is a Weapon-don’t waste it!” and “Raising Food is a Real Job!” The government created various labor programs, including the Women’s Land Army and the Bracero Program, to mobilize civilian women and Mexican guest workers respectively to help fill the void on the nation’s farms. After the US entered the war in 1941, prisoner of war (POW) labor became another possible solution to the labor crisis. The first POW arrived in the country in April 1942 from the Pacific. As the war continued, up to 30,000 POWs arrived in the US each month from battlefields abroad. The War Department decided to utilize this labor force and created camps across the nation to bring POWs work sites across the nation. At the war’s end, nearly 425,000 Japanese, Italian, and German POWs were held in prisoner of war camps across 46 states. 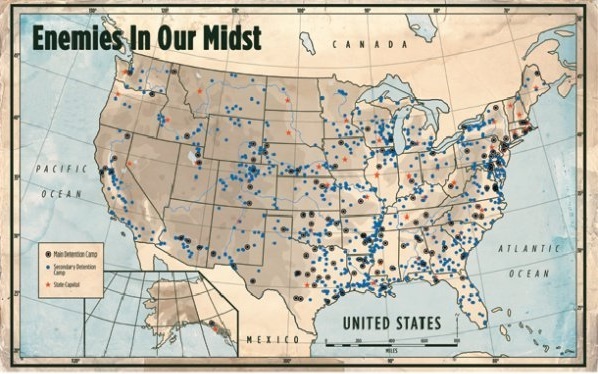 Map of major POW camps across the nation, accessed HistoryNet. Hoosier farmers and food processors jumped at the chance to hire the first of many POWs to arrive in Indiana, despite their enemy status. 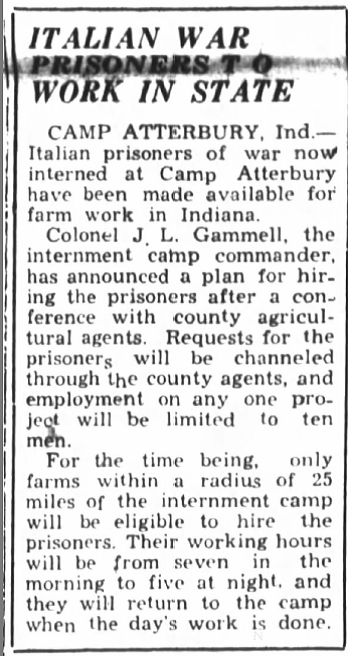 In Johnson County alone, 250 people attended a meeting on May 24, 1943 to discuss the farm labor shortage and to learn how to register for potential POW labor from Camp Atterbury. After POWs filled positions within the camp to keep it running, such as bakers and cooks, launderers, repairmen, and gardeners, the rest could be employed outside the camp at local farms and factories. To the dismay of many farmers, at first the POWs could only work within a 25 mile radius of the camp. They picked apples, beans, and tomatoes, and hoed, detasseled, and picked corn. However, since their labor became so vital, the radius was soon lifted. In the summer of 1943, some Italian POWs also worked in tomato and corn canning plants as far away as Austin and Elwood, Indiana. OWI Poster No. 59, Office of War Information, Washington DC, 1943, photo courtesy The American Legion. POW labor came with stipulations. 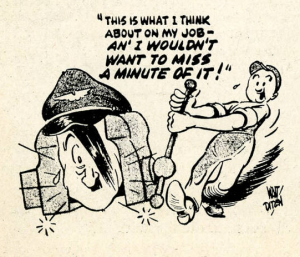 POWs could not engage in dangerous work or labor that directly benefited the war effort. They could also only be employed in cases where civilian labor could not be found. In addition, farmers paid the US Treasury and the War Department the standard prevailing wage in the area so POWs would not usurp local, civilian labor. In turn, those departments paid the POWs 10 cents an hour, up to 80 cents per day for their labor, which was less than the prevailing wage. POWs did not receive cash, but scrip they could spend only at their camp’s canteen. The War Department reinvested canteen profits back into the camps, often to buy “extras” to occupy the POWs in their spare time, such as musical instruments, art supplies, sports equipment, and books. In time, the POWs organized their own choral contests, soccer and volleyball leagues, and boccie ball games. 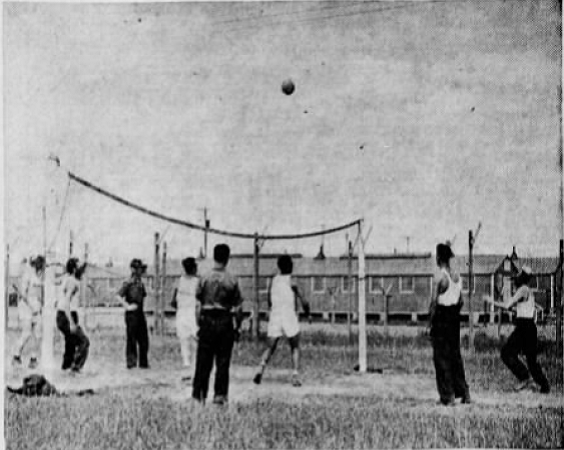 Italian POWs playing volleyball in their spare time at Camp Atterbury, Indianapolis Star, 14 Jund 1943, 17; accessed Indiana State Library, Clippings File. Canteen profits may have been used to finance construction of a small chapel POWs built at Camp Atterbury in 1943. Most of the POWs at the camp were Catholic and wanted a place of their own to attend daily Mass. Prior to construction, prisoners held mass in their rec room and had an altar in an open field. POWs who were employed as skilled artisans before the war designed and built a new brick and stucco 11’x16’ foot chapel for worship. They also painted frescos inside on the ceiling and walls. The chapel still stands at Camp Atterbury. 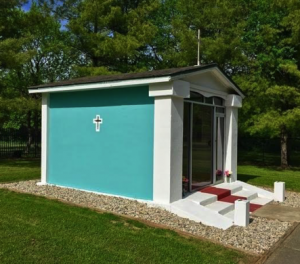 Italian POWs at Camp Atterbury built this chapel, photo accessed AtlasObscura. Entertainment, rations as large as American enlisted men’s, and payment for labor sprouted media reports accusing the War Department of “coddling” the POWs. However, the War Department had logical reasons for providing proper treatment to the POWs in their care besides abiding by stipulations of the Geneva Convention, which laid out rules for proper POW care. Providing good food, leisure activities, and small payment for their work promoted internal camp security and helped sustain a more productive POW labor force. Leaders also hoped good treatment of POWs at home would encourage similar treatment of American prisoners abroad in enemy hands. 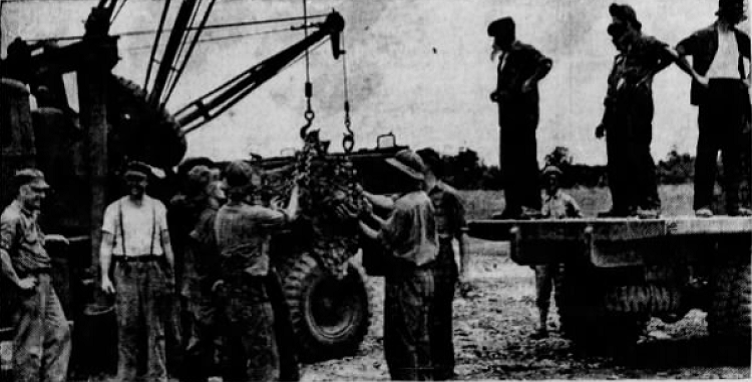 Italian POWs at Camp Atterbury clearing ground for their own garden, Indianapolis Star, 14 June 1943, 17; accessed Indiana State Library, Clippings File. Italy’s surrender to Allied forces in the fall of 1943 threatened Hoosier food producers’ new labor supply. In February of 1944, the War Food Administration advised farmers not to count on Italian POW labor during the upcoming summer. After surrender, Italy became a “cobelligerent” nation and joined the Allied forces. The Italians at Camp Atterbury and across the nation were no longer really prisoners of war, but still were not free until the war ended. Italy’s new leader, Marshal Pietro Badoglio, encouraged all former Italian POWs to help the Allied cause and join labor battalions, called Italian Service Units. Italians were still guarded by American soldiers like other POWs, but now could perform labor that directly benefited the war effort and received other benefits, like increased wages. The War Department began to transfer Italians at Camp Atterbury in January 1944 to these units. All were gone by May 4. Soon after, German POWs arrived and replaced the Italian POWs, just in time to help out in the fields during peak production months in the summer and fall. Several smaller, temporary camps, called “branch camps” were established at Austin, Windfall, Vincennes, Eaton, and Morristown, Indiana to bring some of the Camp Atterbury POWs closer to additional work sites across the state. By October, there were nearly 9,000 POWs in the Camp Atterbury system. Living conditions at the branch camps were less accommodating than Camp Atterbury, which contained proper barracks, a recreation room and a mess hall. Since the branch camps were temporary, POWs often lived in tents close to their work sites. At the Austin camp, prisoners lived in a fenced area behind the Morgan Packing Company where many of them worked. At Windfall, a local farm across from the town’s high school served as the branch camp’s location. Entrance to prisoner of war branch camp in Eaton, Indiana. Photo courtesy of indianamilitary.org. 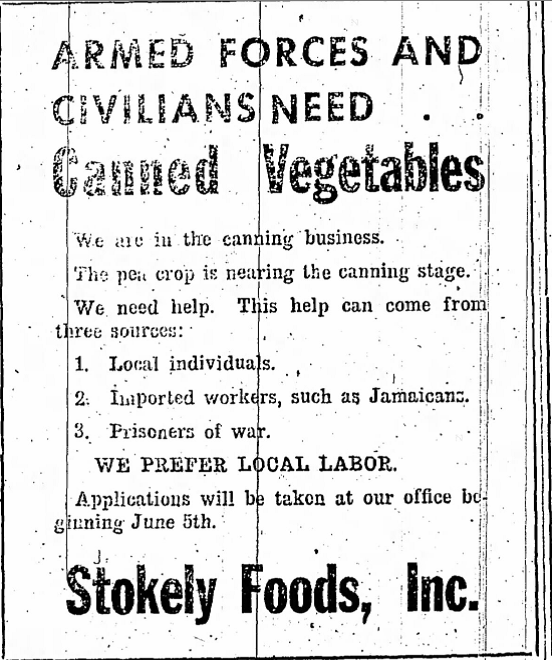 Stokely Foods, Inc. advertisement for labor, Tipton Daily Tribune, 5 June 1944, accessed newspapers.com. As the POWs began working in fields and factories in communities across Indiana, native Hoosiers began to identify similarities between them and the enemy. Farmers appreciated the hard work ethic many of the POWs exhibited harvesting tomatoes and detassling corn. At Windfall, POWs worked in 40 food processing plants in the area. In Morristown, 400 POWs worked at 17 canning plants. POWs peeled and packed tomatoes, canned corn and peas. At the Morgan Packing Plant in Austin, POWs stacked cans in the warehouse, cooked tomatoes before they were canned, helped run the labeling machine, and loaded canned tomatoes for shipping. When the German POWs returned to Camp Atterbury in the fall of 1944, locals at Windfall admitted they would miss the POWs, especially “the outdoor concerts of a large chorus of voices” of the prisoners singing as they worked or rested in the evening. By the end of the war, more than half of all the prisoners of war held in the US during World War II provided essential agricultural manpower. Farmers saw POW labor as so essential, President Truman eventually gave into pressure and kept them in the states to work in farms, canneries, and food processing plants through the fall of 1945 and into 1946 before repatriation. In all, POWs saved hundreds of acres of crops from going to waste, in Indiana and the nation. 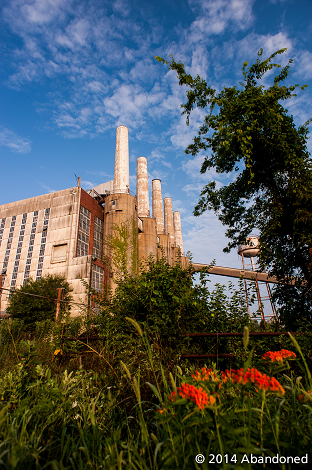 Learn about Charlestown’s rapid transformation resulting from the WWII smokeless powder plant in Part I. 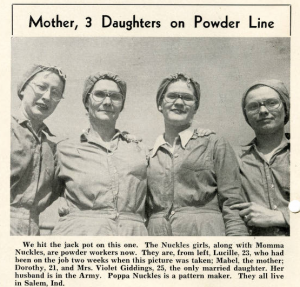 Employment of women and African Americans at the Charlestown smokeless powder ordnance facility, groups that often faced exclusion or discrimination in the workplace, contributed to the plant’s nationally-recognized production accomplishments. Image courtesy of 1945 Indiana Ordnance Works newsletter, Powder Horn vol. 3, no. 1, 11, Charlestown-Clark County Public Library, Indiana Memory Digital Collections. Women were hired in large numbers at Charlestown’s ordnance facility and, while originally serving as mail runners and lab technicians, they eventually replaced men as powder cutting machine attendants. The bag-loading plant known as HOP employed 3,200 workers by December 1941, most of whom were women, who sewed bags and packed them with powder. By 1942, so many women worked at the Charlestown plants that the town had to rapidly expand child care facilities, enlarging the community center nursery at Pleasant Ridge Project. 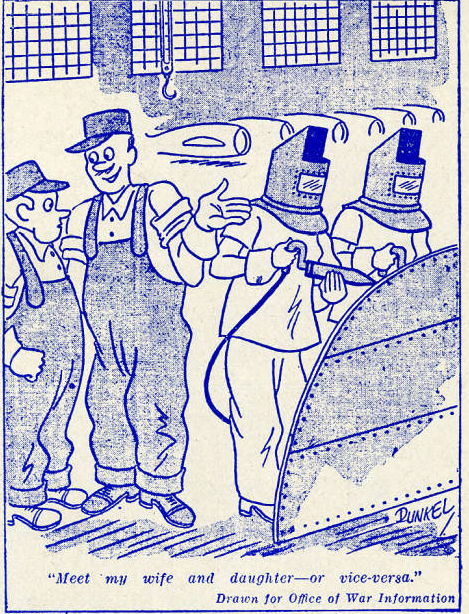 Image courtesy of 1945 Indiana Ordnance Works newsletter, Powder Horn vol. 3, no. 6, 2, Charlestown-Clark County Public Library, Indiana Memory Digital Collections. Much like women in WWII, defense needs partially opened the labor force to African Americans. A questionnaire from the Indiana State Defense Council reported that from July 1, 1941 to July 1, 1942 those firms reporting African American employment experienced a net increase of 82% in the number of blacks employed. Initially African Americans worked at Charlestown’s smokeless powder plant primarily in janitorial and unskilled fields. However, by the end of 1942, due to a labor shortage, they found employment in various roles, such as chemists, plant laborers, and plant operators. 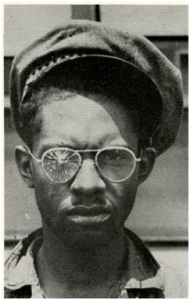 John Williams, Nitrocellulose Department employee, after safety incident, Image courtesy of 1945 Indiana Ordnance Works newsletter, Powder Horn vol. 3, no. 12, 5, Charlestown-Clark County Public Library, Indiana Memory Digital Collections. The boom afforded limited employment opportunities for African Americans outside the plant, despite earlier employer prejudice, which often barred them from working at local Charlestown businesses. The massive Charlestown ordnance facility produced more than one billion pounds of smokeless powder in World War II, nearly as much as the “total volume of military explosives made for the United States in World War I” (Indianapolis Star Magazine, 1948). 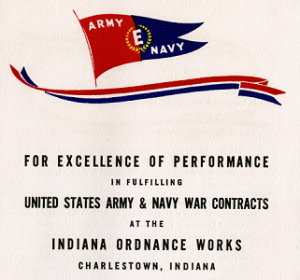 Output levels were so high that the military nationally recognized the facility’s production and safety records, conferring upon the plant the Army-Navy “E” Award, awarded to only 5% of the estimated war plants in the country during WWII. Image courtesy of 1945 Indiana Ordnance Works newsletter, Powder Horn vol. 3, no. 9, 3, Charlestown-Clark County Public Library, Indiana Memory Digital Collections. Indiana Ordnance Works Excellence of Performance Program August 10, 1942, Charlestown-Clark County Public Library, Indiana Memory Digital Collections. The Indianapolis Star reported on August 19 of that year that Charlestown is “dying with the same gusto with which it was born.” The Richmond Palladium described Charlestown folding up “like an Arabian tent village,” as trailer caravans departed and workers returned to various states across the nation. Although the abrupt exodus shocked local residents, worried about maintaining their postwar economy, a trickle of new residents soon arrived, including veterans and their families. 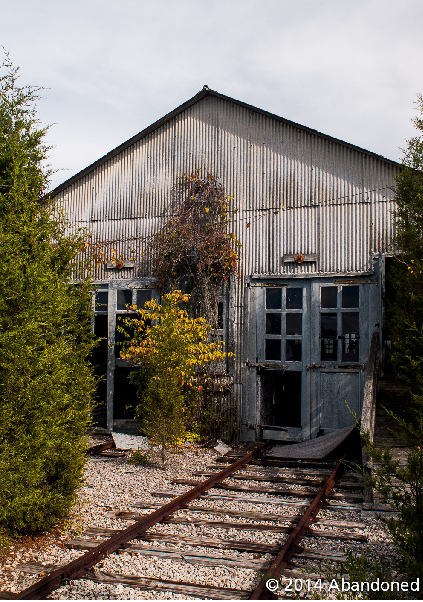 Boom town activity returned to Charlestown during the Korean and Vietnam wars when the ordnance facility again began producing powder, reuniting workers from the WWII era. Charlestown’s 1940s ordnance plants illustrated how WWII energized local economies and afforded women and African Americans job opportunities. Accommodating the massive facility transformed Charlestown from a town to a city and led to its first sewage system,the resurfacing and improvement of miles of roads, and two major housing projects.